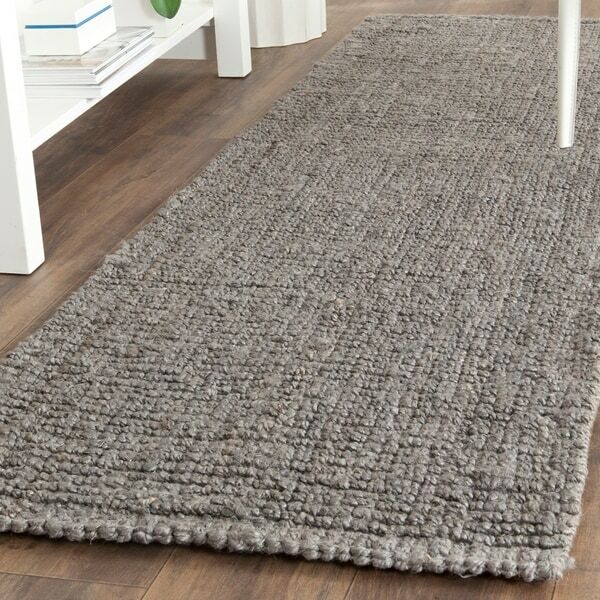 I love jute rugs, and this grey runner is no exception! The color is exactly what I needed and I love the wonderful texture it adds to the entry. I would definitely purchase this again! Promoting a tranquil ambiance, Safavieh's Barbados handwoven pure jute rug has been expertly crafted for those looking to add a carefree vibe to their home. This collection features beautiful neutrals and some fun pops of color that allow for unique customization to your home decor. Featuring a plain weave design, this rug is richly textured with a chunky natural vegetable fiber resembling wool. Excellent quality and color. Medium Gray with a hint of a few brown fibers. Thick, knobby, well made. It was too thick for us. Wouldn't lie flat p, and we tripped in it. I read all the reviews and decided to buy this long runner for the kitchen. Yes, at first it was a little dusty underneath but several good non-beater vacuums did the trick. It is thick and such a wonderful contrast to everything, yet picked up the neutral grays in the floor and countertops. It adds such a nice designer touch that I was looking for--a natural fiber, lots of texture and great feel underfoot. Highly recommend it. One of a kind. I really wanted to like this rug. The shipping speed was incredibly fast, which was really nice. It came well packaged too. The color was not as described or shown in the picture. Instead of it being grey, it was more of a blue color. I bought 3 rugs thinking they would be grey, and now none of them go with any of my furniture. The rugs are now unraveling very rapidly after 2 weeks. Not great quality, and aside from them being the wrong color.... they do look nice. I just have to keep cutting the area of the rug that keeps unraveling. I was so pleased with this rug. I have been looking for a long time for a runner to fit the length of our island/sink.It is 8ft long and perfect width for covering the sink and dishwasher area. Also, it is very pleasant on the feet as these Jute rugs can be very stiff and shed. 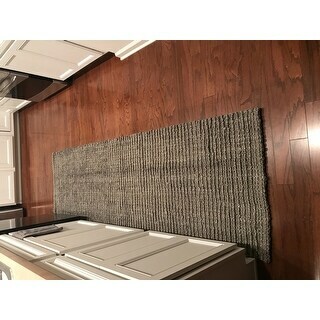 It does recommend a non-slip pad underneath but,I have mine directly on tile and I don't have any issues with it moving around..I think it has to do with the weight which is awesome.I highly highly recommend this rug.The price is amazing too!! Love this rug! Very well made and love the color. I would recommend the purchase of this rug. Love this rug. 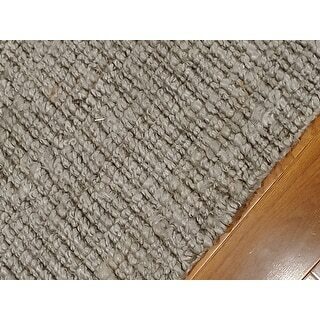 Great gray color and Knobby texture. Everything I was looking for. Just plain jute, soft, but not wool soft, my friend bought one just like it she liked it so much as I do. A beautiful light and elegant gray! love the color - the feel and the quality!! The rug looks nice and is a great color. I especially liked how knotty it was - it feels like a foot massage when you walk on it. I didn't like, however, the thickness (my fault for not taking the into consideration before buying). It was too think that our hallway closet door couldn't open. I also didn't like that the rug came full of dust/particles from the jute; after laying it out there was a thick layer of dust on the floor and I'm not sure how long it would've taken before that went away. Ended up returning because it just wasn't right for our hallway and purposes, but again, overall it looked and felt nice. This is my second one! Sold my house and the buyers wanted the one in that house, so I bought another one for the new house. I have this next to the sink and dishwasher. Vacuums up nicely and because of the colors, it doesn't look dirty! I absolutely love this rug. It’s thick and the color is true to the picture. It is an excellent rug as a runner in my kitchen. I want to purchase another one. The price is excellent! Great quality, fits our island perfectly, feels great underfoot (with slippers on). Love this trig!! Completed out bathroom entry!! Heavy quality rug pad, would recommend for any rug purchase. A good pair of carpet shears allows you to cut it easily into any shape you need. I am very disappointed in this rug! I bought 2 of them! I have wood floors and they leave a powdery residue and shed fibers where they lay and around them! Constantly having to take them out and shake them and dust mop where they layed! Nice area rug. Softer than I had thought it would be and no shedding. It is darker than light grey but I like the color. I'm going to order an area rug to match . "i bought three of these rugs around one month ago. there is a dust/residue that continues to come from the rugs. i have vacuumed 3 times and can't stop them from shedding this residue. i am an easy person to please. if you feel or have comments from other customers that this is a temporary situation i'll understand. 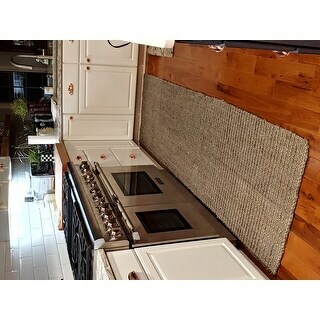 just need some comment from you"
I have really enjoyed this rug on my kitchen hardwood floor. At first I was concerned about the dust as other purchasers had commented, but I wasn't deterred to purchase it. I wanted the texture and color, which was perfect. So, how did I contend with the dust? First, it is natural fiber and that probably would be inevitable, but I vacuumed both sides very well 2 different times, leaving enough time for any dust to drop on the floor beneath under normal traffic wear. Then I vacuumed the 3rd time on both sides and sprayed with a protective scotch guard spray to prevent stains---no problem ever since. I do check occasionally, but have found that the results are near to nothing. I do hope this is helpful. thank you for taking the time to answer. never thought about scotch guard to protect it. rugs are not in my kitchen. "Will I need a non-stick pad underneath this rug on my hardwood floors?" "how do you clean this rug?" We recommend spot cleaning for this rug. I loved the color and natural fibers. Looks like a good fit for my laundry room.